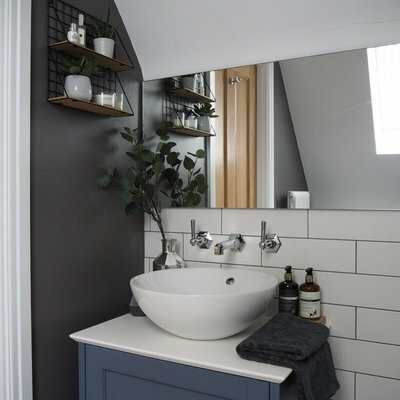 In a small bathroom, it can be tricky to find enough space for storage, but nooks and crannies, unused corners and awkward angles can all offer the chance to tuck in a cupboard or shelf. 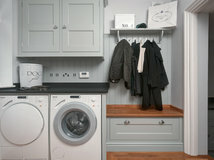 Take a look at these ideas to help you design enough storage to create a clutter-free washspace. If you don’t have room above the basin for a cabinet, you might be able to find some wall space elsewhere. 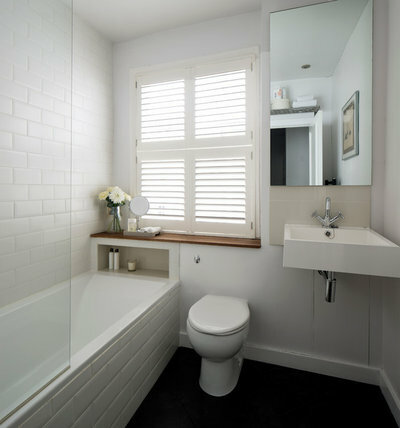 The area above the toilet, for example, can be utilised for storage that goes right up to the ceiling, as here. 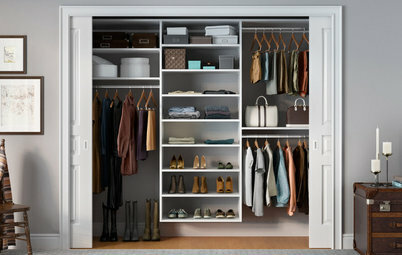 This space is a cloakroom, but the idea could be just as effective in a bathroom. 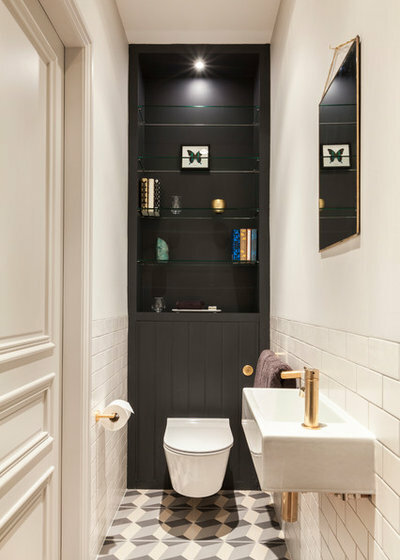 A cabinet has already been constructed to hide the cistern, so the designers have simply made the most of the protruding ledge to build shelving above it. 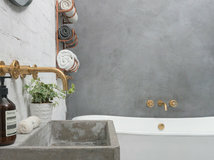 Planning a new bathroom? 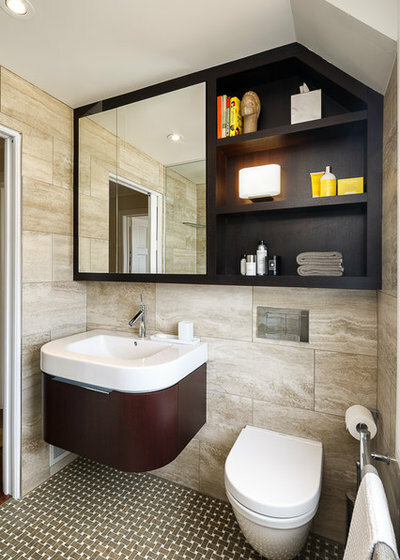 Find bathroom designers and fitters in your area. It’s amazing how much storage space you can find when you look closely around your room. 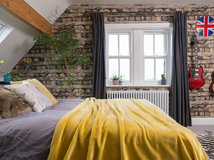 Here, for instance, a small area of wall between the windowsill and bath proved the perfect spot for a niche. 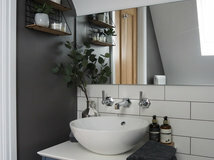 The recessed shelf is just big enough to keep toiletries close to hand for use in the bath or shower. If you’re worried that cabinets will clutter up the space, consider box shelves instead. 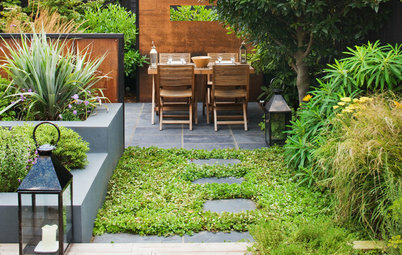 A ledge that’s surrounded on all sides will keep things in place, but the open design is visually spacious. 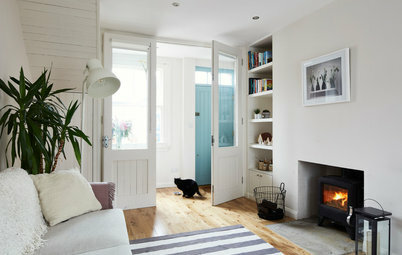 Here, two box shelves are complemented by mini cabinets with slatted doors. 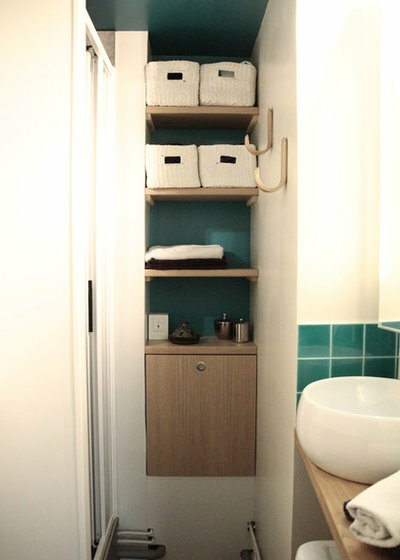 The items add useful storage while keeping a light, airy feel in the small bathroom. There’s a small area of wall space in this bathroom, but it’s not large enough for a cupboard. Instead, attractive wire-backed shelves do the job. They fit perfectly into the narrow space beside the sloped ceiling, and the shallow depth prevents them from intruding into the room. In a very narrow room, you might wonder if it’s possible to fit in storage at all. 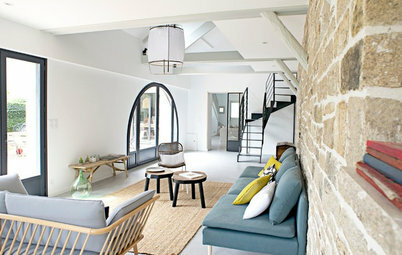 But in this slimline space, the architects have been inspired by the clever design of yacht bathrooms. 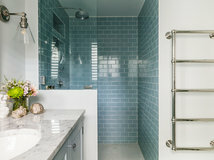 The entire space is waterproof, so the shower could be fitted directly opposite the long, lean vanity unit, which contains numerous cupboards. The basin has been moulded into the Corian worktop and its plumbing is hidden neatly within the cupboard below. In a room with a sloped ceiling, it pays to build with the angles, rather than against them. 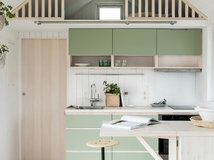 Here, the cupboard has been extended along the entire width of the wall in the form of shelves that tuck under the eaves. 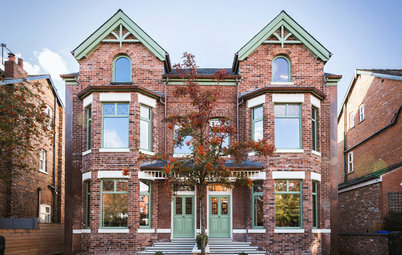 The wide frame that surrounds the two sides continues at an angle to draw the shape of the slope for a designed look. 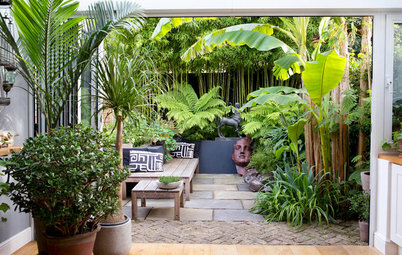 A piece of joinery like this uses every centimetre of space, and creates an attractive feature in the room. Is there a corner in your bathroom that’s not being used, perhaps next to the door? Make the most of the space by installing a column of shelves. 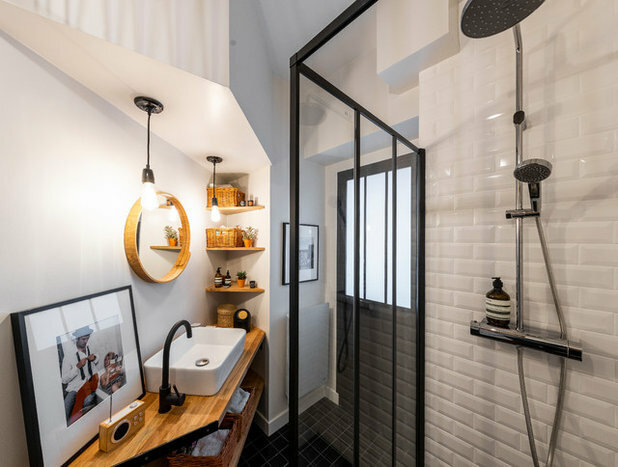 The simple triangular ledges in this room are a practical feature, providing a home for numerous toiletries and adding a decorative touch to the monochrome scheme. 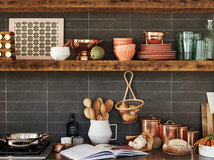 The area is deceptively spacious, too, as the angled shelves are deep enough to hold baskets. Discover things you’re storing in your bathroom that you don’t need to be. 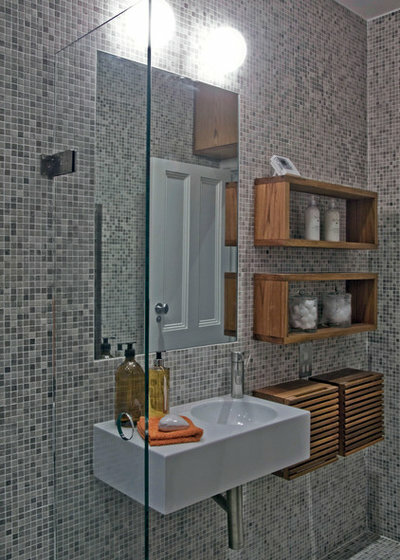 In this compact bathroom, the designers have put a slim area between the wall and shower cubicle to good use. 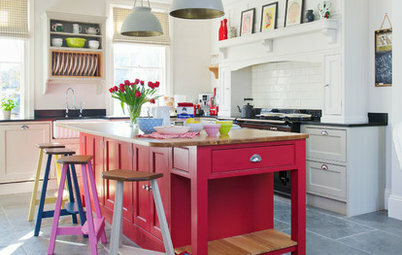 Rather than leave it blank, they’ve installed a cupboard and shelves to create a practical storage area. Don’t forget to make the most of hooks, too. These simple items are extremely effective in a small bathroom with a lack of surfaces, allowing you to keep towels, garments and other items off the floor. Would you use any of these space-saving storage ideas in your bathroom? Share your thoughts in the Comments section. I've deployed most of these in my bathroom. i also have a shelf above the door with baskets containing toilet paper. I will never ever use black for surfaces in a bathroom again! Black marble around washbasin needs constant wiping, loo seat likewise, showing every mark and atom of dust. Dusty places bathrooms with towels shedding, and loo paper too! Thank goodness I don't have black shelving. Hmm, 'The entire space is waterproof...', well yes, it may be so constructed that it doesn't suffer from water damage, but, how often would you spend 3 minutes having a shower, and then 10 minutes wiping down those cupboards and surfaces, which will otherwise be covered in grubby looking water marks? And anyone using the loo straight after your shower will have to traipse over a wet floor unless you've been busy with the mop as well. Why wasn't the shower put at the end of the room? If they can afford to waterproof the room surely they can afford to move the loo plumbing?